Whether it was Rajai Davis battling the snow to make a catch in the outfield, Tom Wilhelmson getting smacked around by his former teammates – and then thrown out of the game for throwing at one of them – or Kyle Schwarber suffering a season-ending knee injury, the Opening Week of the 2016 MLB season has not been easy for some, but it’s certainly been eventful. Where else could we start than Trevor Story’s first four games in the Major Leagues. 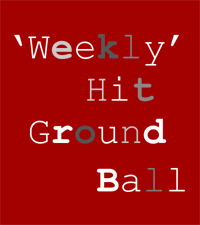 Whilst his home-run hitting streak came to an end on Saturday, his six long-balls had already made him the big story of the week, all the more so thanks to him having a surname ripe for puns and headlines. It will be said time and time again this month that we should not get caught up in April performances. Players and teams can get hot for days or a few weeks at any point during the season and it’s easy to exaggerate the real significance of this when that hot streak comes so early in the season. We saw a similar event ten years ago. Then it was the Detroit Tigers’ Chris Shelton who hit five home runs from the first four games of the season. He hit only 11 more across the rest of the season and played just 50 further Big League games across 2008 and 2009 before his Major League career came to an end. Later that same month, the Texas Rangers’ Kevin Mench hit a home run in seven consecutive games and left some wondering if the streak would ever come to an end. It did, of course, and he subsequently hit only five more bombs across the rest of the season with the Rangers and Milwaukee Brewers before playing out the final 179 games over the next four years during which he hit eight home runs in total. Not much was expected of Shelton or Mench. In Story’s case, it was already thought that he could provide some legitimate power to the Rockies’ offence. His Baseball Prospectus 2016 capsule noted that he had amassed some high strikeout totals in the minors that could carry across the Majors, but “in between some awkward flails at wayward breaking balls he’ll inflict serious damage”. Six homers in four games certainly falls under the definition of “serious damage”. Like all young players he will go through some growing pains as pitchers learn and exploit his weaknesses and he will then have to adjust his approach, but there’s reason to believe that Trevor’s story won’t end on these first four games and there will be plenty of chapters to enjoy in the years ahead for him at Coors Field. After Chase Utley broke Ruben Tejada’s leg in the high-profile 2015 NLDS game between the Dodgers and Mets it was inevitable that a new rule would be introduced. It was also inevitable that it would cause some problems early in the season; however, few could have predicted those problems would come in two game-ending plays during the first week. The first occasion between the Rays and Blue Jays was more clear-cut once the emotion of the game was removed and John Gibbons’ embarrassing ‘wearing dresses’ comment was rightly condemned. Jose Bautista made his slide into second base and then clearly went to grab Logan Forsythe’s leg with his hand. That’s not breaking up a double-play, that’s intentionally interfering with a fielder. The ruling that ended the Houston Astros’ ninth-inning rally against the Brewers on Friday night was not so clear-cut. It was clear in the sense that Colby Rasmus broke the new rule by sliding past second base, but not in the sense of complying with the reason for bringing the rule in. The infielder was at no risk and had no intention of trying to turn a double-play, yet the umpires correctly applied the rule as it’s now worded and awarded the Brewers a double-play to end the game. It’s safe to say that some clarification on how the rule should be interpreted will be provided by MLB in the next couple of weeks to bring it more in line with expectations. It’s equally safe to say that having games end on a replay review is one of the most jarring compromises to be accepted alongside the benefits of the replay system. The debate around whether the Designated Hitter rule should be extended to the National League has some very entrenched views on either side. Personally, I like to see professional athletes having to work on different facets of their chosen sport – skillful rugby players needing to get their tackling and positional sense up to a level where they’re not a liability etc – and I’m quite happy to live with pitchers getting over-matched if that means they have to develop their ability to get a good bunt down. It also means that the pitchers that can hit get to enjoy themselves occasionally. Madison Bumgarner did just that against Clayton Kershaw yesterday with a home run to left-field, the second time he’s taken Kershaw deep. MadBum won that battle, but Kershaw and the Dodgers won the war that day with a tenth-inning 3-2 victory.